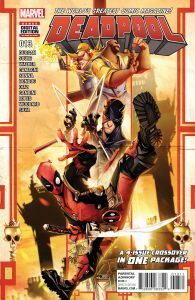 What do you get when you take a Merc With a Mouth, two Heroes for Hire and a Man Without Fear and mash ‘em together? 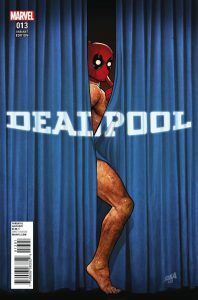 Why, the massively oversized DEADPOOL #13 of course! This June, this quartet of heroes collide in the first-ever 4-part crossover in one issue! We’re not joking – this issue contains two full issues of Deadpool, one issue of Power Man and Iron Fist and one issue of Daredevil! Writers Gerry Duggan, David Walker and Charles Soule join forces with artists Jacopo Camagni, Guillermo Sanna, Elmo Bondoc and Paco Diaz to bring you one for the history books! 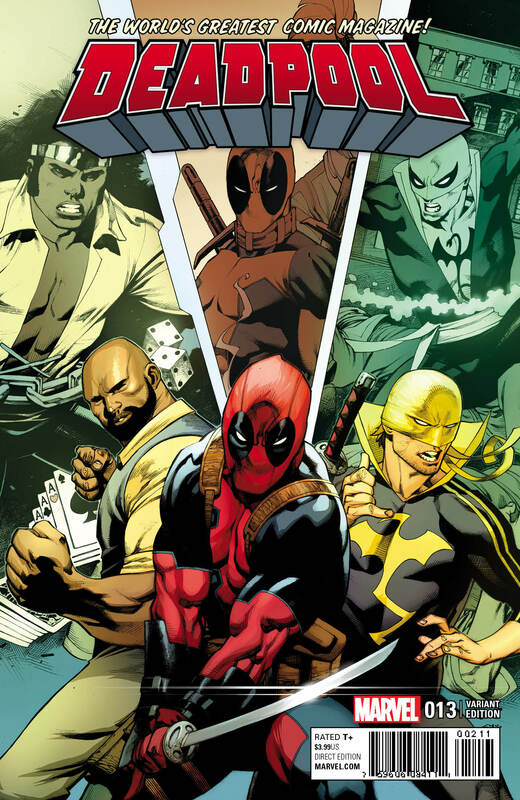 When Deadpool takes a gig protecting a banker who betrayed his nefarious cartel partners, they seek the help of ADA Matt Murdock, who calls in the assistance (and fists) of Luke Cage and Danny Rand! Things are going to get ugly. Get ready for a mega-violent, street-level, gut-busting, face-punching, kung-fuing, ninjitsuing crime story you won’t want to miss! 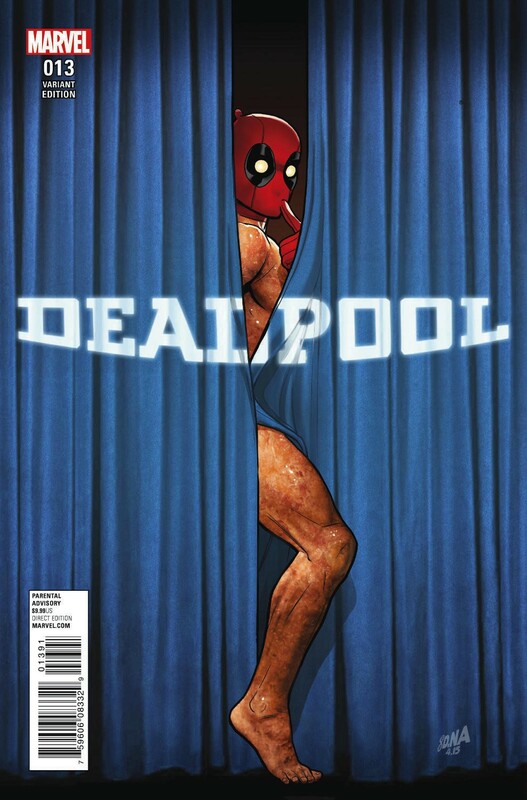 It all goes down this June when DEADPOOL #13 explodes into comic shops everywhere! 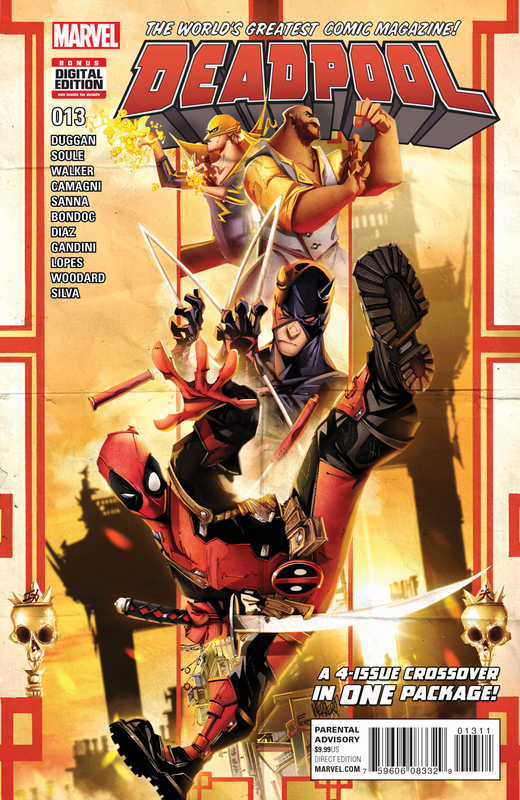 DEADPOOL #13 – Written by GERRY DUGGAN, CHARLES SOULE and DAVID WALKER. Art by JACOPO CAMAGNI, GUILLERMO SANNA, ELMO BONDOC and PACO DIAZ. Cover by FRANCISO HERRERA. Variant Covers by ROB LIEFELD and RON LIM. Power Man and Iron Fist Variant by CHRIS STEVENS, Daredevil Variant by KHOI PHAM & Hit Monkey Variant by BRENT SCHOONOVER. Action Figure Variant by JOHN TYLER CHRISTOPHER & Rebirth Variant by DAVID NAKAYAMA.